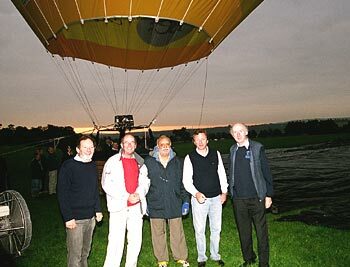 When the monsoon was active over most parts of India and it was not possible to do any balloon flying, Dr Singhania made the best use of his time by flying in UK and in France. This varied experience in different terrain and weather conditions has certainly boosted his confidence. Right until the end of September extensive tests continued for the design of the capsule and the burners. As the main challenge is to keep a flame burning in near vacuum conditions, extensive tests were carried out in the specially fabricated vacuum chamber. The design philosophy and structure were aggressively addressed by Andy in his workshop at Glastenbury, near Bristol. By now the envelope was also ready for testing at the Cameroon factory. All was going on schedule as planned. 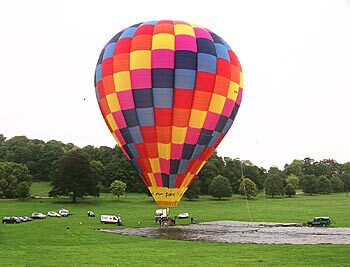 On the morning of the 4th of October, which also happened to be Vijaypat’s birthday, the envelope was inflated at a field near Bristol. 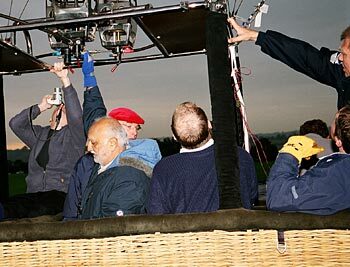 All the heavy weights of the ballooning fraternity, from the region, were present to see the massive envelop. It was, indeed, a sight to behold. With all preparations nearly complete and the capsule undergoing its painting job, the theater for the high drama is about to move to Mumbai, India. The launch site is to be the racecourse at Mumbai. The managing committee has graciously extended all help for the mega event, as have many government agencies, the Indian Air Force, Navy, Coast Guard, Airport Authority, the DGCA, the Met department, and the Aero Club of India. With the support and assistance of so many, the venture is bound to be a success. On 19th November Dr, Vijaypat Singhania is expected to lift off at dawn from the racecourse to achieve a historic record and a place in the Guinness Book yet again. The public, press and VIPs are being invited to witness a sight that is expected to be once in a lifetime experience.